Hair loss can be stressful for men to deal with. So imagine how a woman feels if her crowning glory starts to thin out. Fortunately, hair loss in women is less common than in men. But for those that suffer it is a plight as more and more woman now suffer. Hair loss in women can be due to genetic factors. 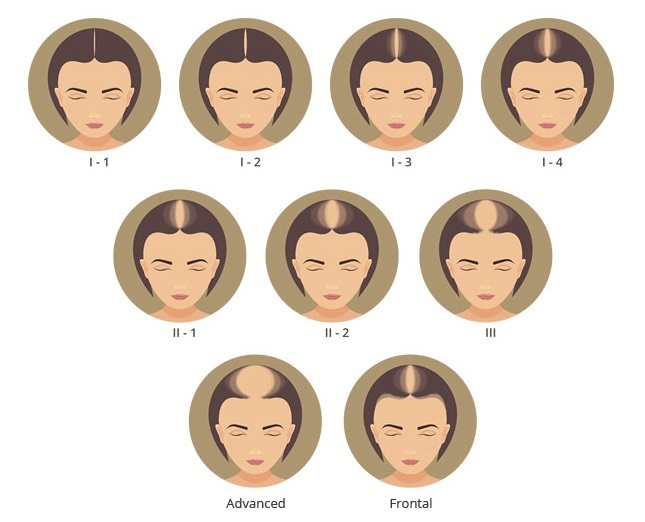 This is called androgenic alopecia or female pattern baldness – FPB. It can start as early as puberty. Up to 50% of women having some degree of hair loss due to genetic factors over their lifetime. Other reasons why hair loss can occur in woman, post-pregnancy, stress, diet, hormonal imbalances, illness, and medical operations such as chemotherapy and anti-cancer drugs, traction, chemical damage and sometimes even self-induced hair loss. Female hair loss can hold many complexities. Especially compared to hair loss in men. As a result in most circumstances before any diagnosis, a blood test should be undertaken. To try to rule out any systemic deficiencies. Possibly related to blood or hormones. Blood test requirements can include a full spectrum blood count; iron (Se Ferritin), thyroid stimulating hormone (TSH), blood sugar level (BSL), estradiol (E2) and erythrocyte sedimentation rate (ESR) which is a non-specific screening for various diseases.